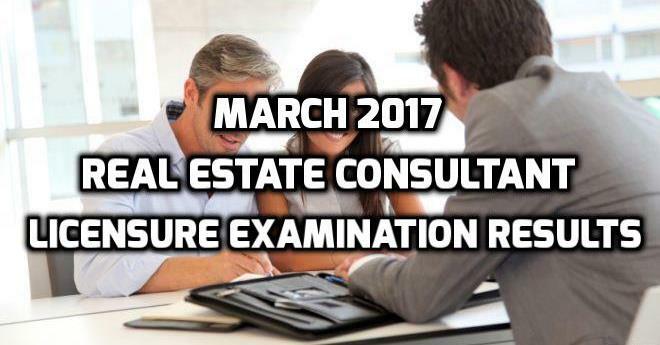 From the latest announcement of the Professional Regulation Commission (PRC), it already released the names of board passers for the January 2018 Real Estate Consultant Licensure Board Examination. As detailed by the commission, 40 applicants took the exam and 30 of them passed successfully. The Board of Real Estate Service administered the recent licensure examination held last December 17, 2017 for the Written Phase and January 9-12, 2018 for the Revalida. The PRC was able to release the names of passers after 3-working day of the final scheduled exam. According from the official website of the PRC, the issuance of Professional Identification Cards (IDs) registration and Certificate of Registration will be on January 19-22 this year. On this matter, it is important for those who passed the exam to visit the website of the commission to determine the instructions and other necessary details before the registration. 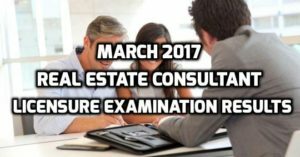 From the recent Real Estate Consultant Licensure Examination held in Manila given by the Board of Real Estate Service, the Professional Regulation Commission (PRC) already released the list of passers. They held the exams on December 11, 2016 (Written) and January 10-12 & March 29-30, 2017 (Revalida) both in Manila, as detailed by the information online. Out of 44 examinees, 31 passed the examination as announced by the PRC. The Board of Real Estate Service members provided the licensure exam headed by Chairman Dr. Eduardo G. Ong, with members Rafael M. Fajardo and Florencio C. Diño II. The commission was able to release the results after the final day of the scheduled examinations. According from the official website of the PRC, the registration for the Professional Identification (ID) as well as Certificate of Registration issuance will be on April 5, 2017 through online transaction.